When somebody tells me about some amazing fast food concoction like the Grill ‘Em All Truck Behemoth, served with grilled cheese buns, smoked cheddar, apple wood smoked bacon and beer soaked onions, the Vortex’s “Elvis,” a burger topped with bacon, cheese, fried bananas and peanut butter or even the KFC Double Down, two 100 percent all white meat chicken filets topped with cheese, bacon and the Colonel’s Sauce, well I get all excited and start to figure out when I can go eat these super-hero like mutant food concoctions. That is what they are meant to do. In fact, I can honestly say that an experience like this has never once inspired me to make the food I crave become more healthy. Such was not the case with Adam Kidron. The story is best told by Adam himself in this animated short. 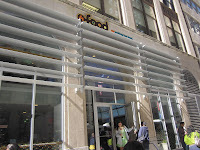 4food Promo from Adam Lukas on Vimeo. 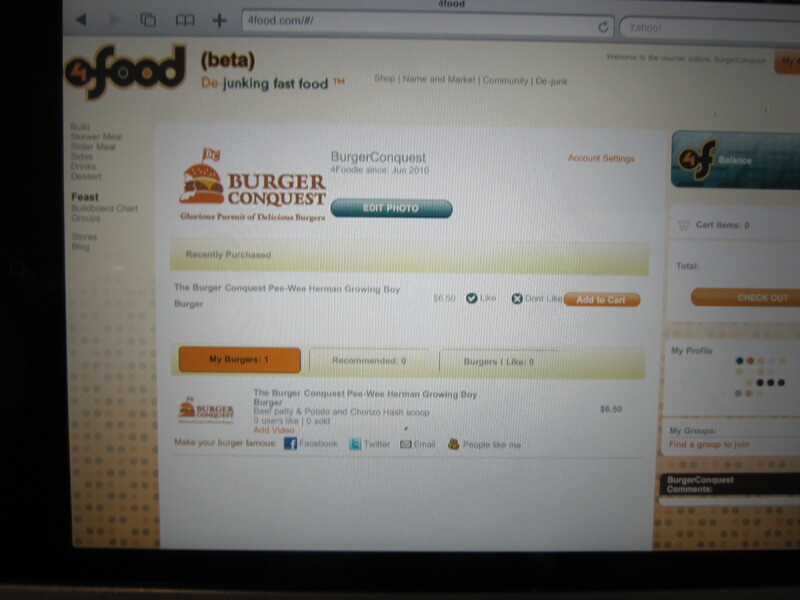 With a daunting 140 million possible burger combination’s and a promise of de-junked fast food that was “fresh, nutritious, delicious, reasonably priced, made from natural ingredients and customizable to our taste,” my curiosity was certainly up on 4Food. On my first attempt at dining there, I learned something very, very quickly, if you are indecisive by nature, 4Food is going to confuse and intimidate you. As I approached the counter, my mind went blank and I couldn’t remember a single ingredient that I had wanted in my sandwich. Thankfully the counter servers are extremely patient and helpful. I along with my co-workers John, Jason, Jessica and our clients, Bambino and Jason, carefully selected our burger and toppings in a calm fashion, remembering to breathe and take breaks where necessary. With so many customizable choices and a party of 6 our receipt ended up looking more like a mini-scroll, several feet in length! 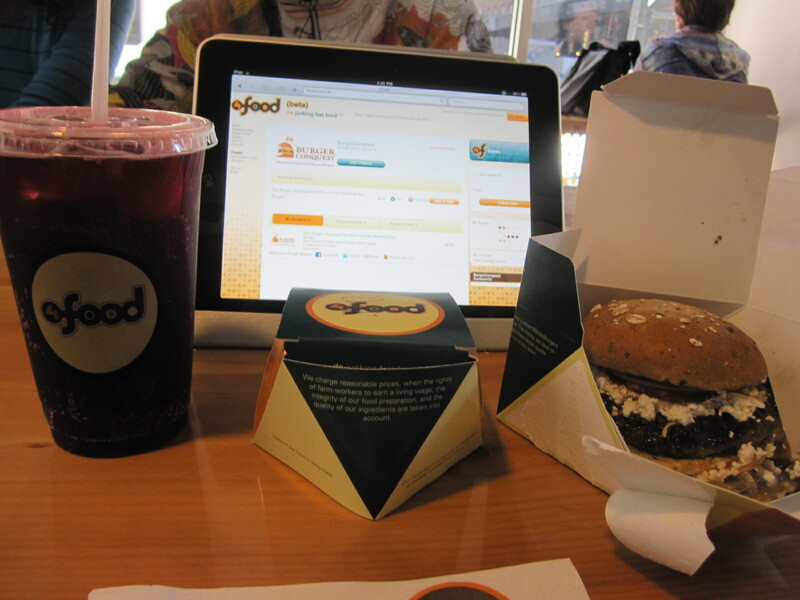 A few moments later, our name was called “Burger Conquest your order is ready” and we were carrying our food down into the dining room, stopping only to see our Foursquare check ins and tweets @4FoodNYC displayed on their electronic wall. After much trepidation, I pulled my act together and ordered a breakfast sausage patty, Mac n cheese, lettuce, onions, sweet chili, pancetta and mozzarella on a whole grain bun, AKA the “BurgerConquest” bomb. While I was extremely tempted to go with a more traditional beef but the allure of a breakfast sausage burger was too enticing. 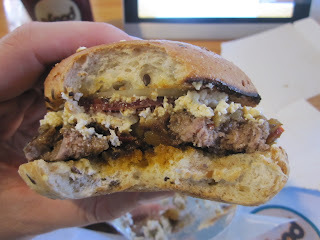 Every item that was used to make the burger was as fresh and filled with flavor. I have to pat myself on the back in my selections as no one item dominated over the others. I mean seriously, could remove half the items and it would probably still be really good. My two favorite elements were the sweet and hot chili sauce and the creamy scoop of mac and cheese in the middle. Because it was only in the center of the sandwich, where the burger munchkin had been removed, it turned it into 2 sandwiches in one. The sausage patty had a sweeter, spicier and juicier than a beef patty would’ve have been and added to the uniqueness of the taste. Curious about the munchkin burgers, I opted in to a 4Food slider as well. Sliders come with your choice of meat, 1 condiment with 1 scoop and 1 side as a side. 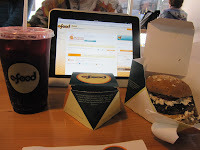 Here was my chance to try the beef at 4Food! I ordered it topped with horseradish cream. The sliders come on tiny little bun and aren’t any bigger than 2-3 bites. Its certainly an interesting concept but truthfully, not the reason to come here. The tiny little patties are well done and a little dry but it’s tough to server such a small patty any other way. They aren’t bad but definitely play your hand with the full size burgers. On the side I got both veggie chili and square roots. Square Roots are “4food’s French fry alternative. Idaho potatoes, sweet potatoes & purple potatoes are all diced into 1 inch by 1 inch cubes. Boiled in water seasoned with herbs, fresh garlic and spices then roasted for a very crunchy and tasty alternative to a deep fat fried French fry.” Man, do I love me some french fries but there is always an air of guilt in shoving and order of them into my mouth. With the Square Roots, that is gone and the best part, they taste great! The boiling process allows you to actually taste the potatoes unlike with french fries where you are really tasting the oil and frying process. By the time I had eaten through the 2 burgers and the roots, I didn’t have any room left whatsoever for veggie chili. About a week later after our visit to test drive out 4Food something interesting happened there. Renowned comedian and bizarre children’s TV show host Pee-Wee Herman walked in their front doors and had lunch. Pee-Wee most known for his “Pee-Wee’s Playhouse” TV show, was in NYC to promote the return of the Playhouse as a live Broadway show. Pee-Wee was walking around the city, saying hello to the locals, joining in pick-up basketball games , riding the NY Subway, and hanging out with fans. Suddenly the webiverse was crazy with twitpics and Pee-Wee sightings. The entire day was a marketing tie in to Foursquare where devoted Pee-Wee fans, like myself, could friend him on the social network and then earn a “Pee-Wee Herman Show” badge by checking into the same locations as Pee-Wee himself. All you had to do was keep an eye on his twitter account as he was announcing his current location. Unfortunately I have one of those, what do you call them?? Oh yeah, day jobs, so I couldn’t jump up from my desk and go meet the man myself. Pee-Wee kept uploading photos of his adventure to his facebook account and when I saw the picture of him with the staff of 4Food, I was particularly bummed I couldn’t hop into a cab at that moment and have a Burger Conquest with one of my childhood idols. A 4Food doughnut shaped beef patty topped with onions, potato chorizo hash, smoked mozzarella, sopressata & sweet chili, served on a multi-grain bun. I placed the order right there in the restaurant using one of their iPads at the internet station and anxiously waited for them to announce it’s arrival. The sweet whole grain bun really draws a flavor perimeter around the whirlwind of tastes contained with. The starchy potatoes, the spiced chorizo and the tasty sopressata combine in a savory “I know you are but what am I?” battle around the saltiness of the smoked mozzarella cheese and the sweet heat from the chili sauce and onions. It’s actually a little surprising how much the mild potatoes really contribute to the taste sensation. The patty while having a clean, natural flavor is small. This means the patty is cooked to a medium well and a little more dry than I would prefer but nothing that would leave Cowboy Curtis hungry. 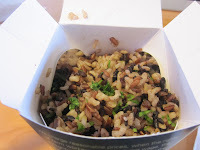 I ordered MultiGrain rice as my side, “brown rice, red rice and black rice are all cooked separately and combined in the amounts of 50% brown rice, 25% red rice and 25% black rice. Each rice is cooked in homemade vegetable stock, bay leaf and whole garlic. Salt and black pepper seasoning is added at the beginning of the initial cooking process so the end result is grains of rice that are seasoned from the inside out due to the flavorful seasoned liquid they are cooked in. Fresh chopped parsley is added on top as garnish.” I found it to be a little dry and slightly chewy but you can’t argue, bland is something it’s not! I loved the way it tasted. The truly unique and refeshing part of the meal was my beverage. I ordered a hibiscus soda and it was fantastic! Bubbly, sweet and not bad for you. If I had this growing up, I probably wouldnt be so addicted to soda! 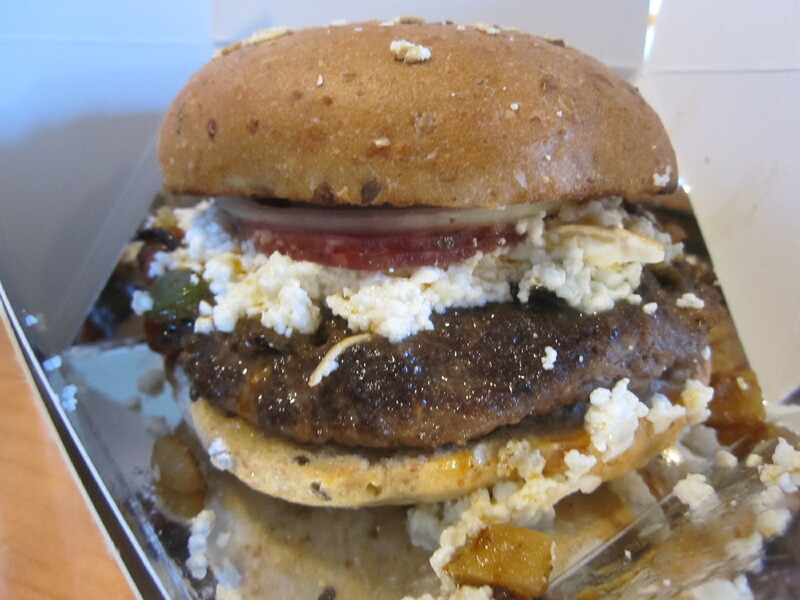 My final thought on 4Food, it’s like all the most awesome burger toppings going at it in an old school WWF battle royale and your tongue is declared the winner. 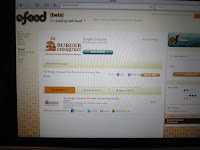 Not only can you design your own burger on their website but you can also market and promote it. 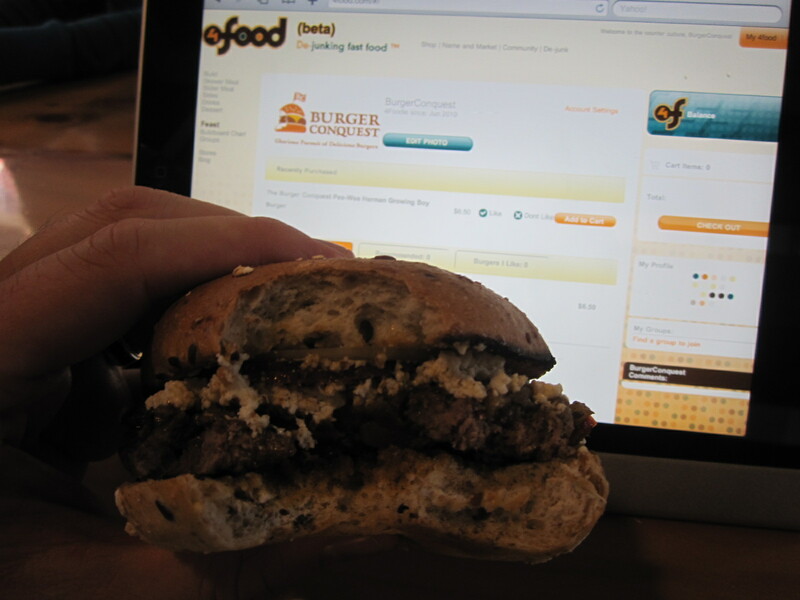 If your burger becomes a crowd pleaser, it is added to the suggestions menu at the restaurant. What exactly does that mean? You can go to 4Food yourself and get yourself The Burger Conquest Pee-Wee Herman “Growing Boy” Burger! Just ask for it by name or order online. Pee-Wee may not be willing to sell you his bike for all the money in the world. Not for a hundred million, trillion, billion dollars but this burger will only set you back $6.5o. This entry was posted in Uncategorized and tagged the great burger conquest hamburger cheese reviews new york ny nyc 4food de-junking fast food pee-wee herman spotted 4square foursquare. Bookmark the permalink.